Dr. Eva Aagaard is a Professor of Medicine and Senior Associate Dean for Education at Washington University School of Medicine and practices at Barnes Jewish Hospital. She is certified in Internal Medicine and serves on ABIM’s Internal Medicine Board. Even as a young girl, I was fascinated by health and disease. I have no doctors in my family, but as young as 5, I remember saying that I wanted to be a doctor and have never really waivered from that goal. Once I started medical school, I became even more amazed by the beauty and complexity of medicine. I was awed by the human condition and all the things in life that contribute to who we are, what ails us, and how we are able (or not) to manage it. I have never lost that wonder, the desire to understand why things are the way they are and what can be done to help. I feel honored by the privilege that my patients extend me, the window they provide into their world. I feel humbled by all that there is to know and I feel blessed that I have the opportunity to learn and grow every day while hopefully making my patients’ lives a little better. Medicine is about listening and seeing first, and talking second. I have knowledge about my patients’ health and disease, but they also have knowledge about themselves and how their condition fits into their life. Listening, seeing and communicating are the foundation of both diagnosis and shared decision-making. This shift in thinking has made my work immensely more satisfying. Each year, students are asked to invite someone important to them or their education to serve as their hooder at graduation. This year, I was asked to hood two of our graduating students, both of whom I worked closely with clinically. It is a huge honor to be asked as it symbolizes that I have been able to contribute positively to their education as a physician. Watching students get their diplomas, placing their hoods on their shoulders and seeing the pride in their family’s faces is one of my favorite moments each year. I don’t tend to talk about my work with others outside of the medical profession. However, when teaching residents and students, I will often talk about the fact that death is not necessarily a failure and that part of our role is to help people as they face their mortality. To that end, I sometimes tell the story of a man I cared for with end-stage interstitial lung disease (ILD). He was an oil and gas engineer and had traveled the world for his work. He was from Australia originally but had moved to the U.S. more than 20 years ago. When we discussed that his ILD had reached the final stages, he asked me to help coordinate bringing his family in to be with him. His son and daughter flew from Australia, and we spent many evenings talking about his life, his role as father and his amazing accomplishments in his career. I was with them when he passed away. I went to his funeral. It was such a privilege to know him and his family and to help them as they transitioned. I tell this story to my students, because I hope that they will take this part of our role as seriously as their role as diagnostician and manager of disease. I think there is a misconception about how we spend our time. I think our patients and society know that we are busy and work very hard. However, I think they would be surprised and somewhat disheartened to know that administrative work, charting and conversations with insurance companies takes up a lot of our day and sometimes detracts from our attention to them. How would you describe your experience of joining and serving on an ABIM Specialty Board? I wanted to serve on the Internal Medicine Board because I am very proud of being ABIM Board Certified. For me, it is a mark of excellence that signifies that I am both knowledgeable and care about keeping up with my specialty. I also believe the Board is doing critically important work in thinking about the future of our profession – what it means to be a professional and how we demonstrate it. Prior to joining ABIM governance, I didn’t realize the ABIM was so invested in developing partnerships with both physicians in practice and our professional societies. I’ve met a wonderful group of colleagues in both academic and private practice, representing a range of clinical roles and responsibilities. I’ve also met allied health professionals and patients who are dedicated to helping us think about the issues facing Internal Medicine today. ABIM and ABIM Foundation are involved in supporting a huge number of efforts ranging from milestones to the professionalism charter all with the goal of supporting our community as it transforms in response to the changing health care environment. The best thing about serving is feeling like I am contributing to the future of this amazing profession by representing my colleagues, listening to diverse perspectives and participating in decisions that help shape our specialty. It is incredibly hard to represent all perspectives in a specialty as diverse as Internal Medicine but I believe the Board has tried very hard to do this well. 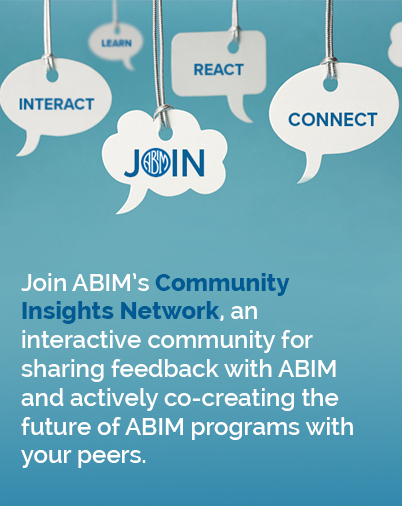 I have learned so much from participating in and watching the process of trying to meaningfully engage the community on behalf of ABIM. It has been a leadership lesson that I will never forget, and I would encourage others to serve because it provides a critical understanding of the Board and our profession as well as the unique privilege and responsibility we have to be self-regulated. This lens has really helped me to have a better understanding of why decisions are made. I enjoy the outdoors, running, swimming, biking and hiking. Last year, I finished an Olympic triathlon, which was extremely difficult but still an accomplishment. I also have a very supportive family who I love to spend time with.